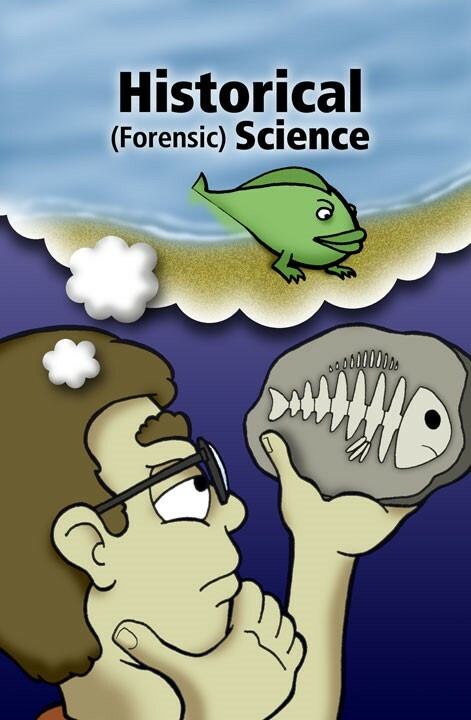 Two types of science: Operational or experimental and historical or forensic. Historical science deals with origins, the unseen past, unobserved past events. Operational science deals with the present, not the past. Most people confuse or conflate these two types of science. They are not the same. The former is repeatable and the latter is not. Most scientists themselves do not understand the distinction. They often are too close to the subject to realise. When a forensic scientist enters a crime scene he collects evidence. These are, for example, bodily fluids, tissue samples, fingerprints, paint scrapings, etc. He goes to his lab and uses sophisticated machines to determine the DNA of the victim or perpetrator, or scan for a fingerprint match in a data base, etc. That is repeatable science, hence operational science. Following that the forensic scientist puts together a story, about how the crime may have been committed. He may even determine a possible sequence of events, but without a time machine, it is impossible to see into the past. This is historical science. Actions that have already occurred in the past are not repeatable and in that sense they are not subject to experimental science. This is the weakness of all evolutionary stories. The evolutionist does not have an eye-witness to the past history of the Universe, or the planet Earth. A definition from Dictionary.com for ‘science’ is: “systematic knowledge of the physical or material world gained through observation and experimentation”. Therefore historical science is actually excluded from science by this definition. I would agree. It is really history or philosophy. This all makes historical or forensic science very weak. Like in the picture here the scientist is only imagining the past history of the fossil he has in his hand. Cosmology also is historical science. It is not repeatable to the extent you can test the origin of the Universe, or that of a galaxy or even a star. Only computer simulations are used, but they are not testing anything of the actual universe. In those simulations normal matter is not used, but only fictitious dark matter, with fictitious dark energy. Both of these entities are not found in laboratory experimental science. They are unknown to the science we practice in the laboratories worldwide. They would be better labelled as ‘fudge factors,’ at least until they can be established by repeatable operational science. It is our worldview that determines how we interpret the historical science. What do we allow as evidence for the past origin of something? Contrary to what you are told, evidence does not speak for itself. Even in the CSI TV show you often hear “follow the evidence” or the “evidence never lies.” True…, but it does not speak because it does not have a literal voice. It can tell us something about in terms of unobserved past events but to do so it must be put into some context to be understood. To put it into context scientists are always biased by their own worldviews. There is no absolute way of knowing about the past outside of an eye-witness. The Creator is our eye-witness, and when, where and what He has told us we can know. But where He has not we are subject to the same constraints.